Continuing from this morning's blog post - my pumpkin gnocchi are delicious. Who cares if they aren't the same texture as one's you have had before! They are my first taste and I really like them. I boiled them in water and then browned them in just a tiny bit of coconut oil with fresh sage from the garden and dried cranberries. It's lovely to split them with a fork and see the orange pumpkin color peeking through. And made from garbanzo flour and psyllium husks, they are a wonderful source of fiber. As I always tell my students - try a new food every week. You never know what is out there that you will really love. It's worked today, for sure......and yesterday actually with those rose hip truffles....time to make more of those for friends coming around tomorrow. Have a great weekend and try something new! While yesterday's OOO-breakfast is yummy - it is quite sweet, even though it has no added sugar - but the sweetness comes from the bananas and mango. So I made this version of a 'pretty parfait' - OOBBP, using berries instead and changing the oats a little. If you have a sweeter tooth - you can still use this recipe but go for all strawberries - but I like a bit of tartness so added cranberries as well. Puree the strawberries and cranberries together until smooth in a food processor. Place the oats, chia seeds, milk, vanilla and cinnamon in a bowl and stir together. Add the apple sauce and mix thoroughly. To assemble the parfait, divide approx. half of the oat mixture between three serving glasses/bowls. Add a layer of strawberry/cranberry puree using approx. half of the puree. Add the remainder of the oat mixture to make a third layer, and finally top with the remainder of the strawberry/cranberry mixture. Top with a sprinkle of oats and chia seeds. I also added a dehydrated apple ring. Put in the fridge overnight, during which time the oats will soften and thicken. This will last for 3 days....if you can stop yourself eating them for lunch as well - which is what I did! Again, this breakfast is giving you a good dose of omega 3 fatty acids from the chia seeds - and I used flax milk as well. I have found a flax milk I really like, called Good Karma Flax milk - only 25 calories and 1200 mg omega 3 per cup serving. You can use fresh or frozen fruit for this - and any berries that you like. I think it would be lovely with blackberries and raspberries together. Or strawberries with cooked rhubarb - yum! Which do you think is prettier? The mango/banana or the berry parfait? 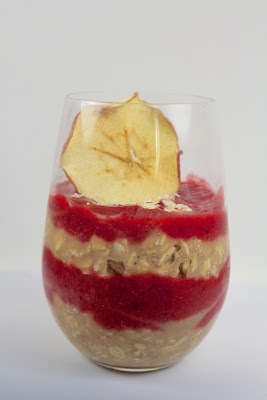 I'd go with the berry - love that bright red coloring with the neutral colored oats.